Looking for Bank Vault or Safe Locks Services in South Florida? At Jim Bryan Safes we provide, service, move, repair and install Bank Vaults and Safe Locks. For the past 50 years we have helped many local banks through Miami-Dade, Broward, Palm Beach and Monroe county. Keep your clients assets protected! Valuables cast out of precious metals and stones like gold and diamond are considered assets, and it’s always a great idea to keep them protected from any damage or theft. Most home owners keep valuables at home, in a secret drawer underneath clothes or in a hidden area of their home. 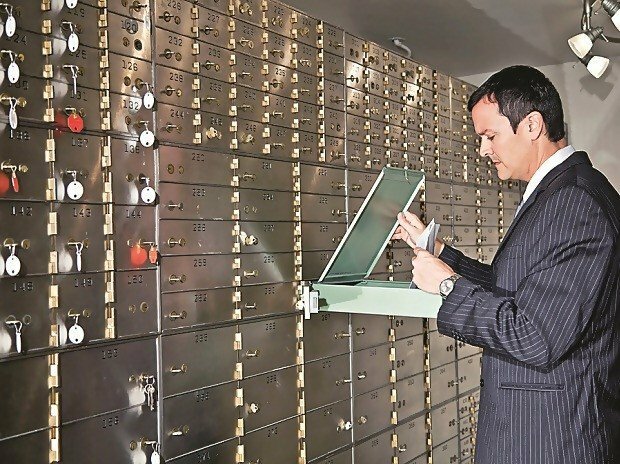 But what worries the majority of people is the fear of losing these valuables due to various reasons and that is why a large part of the population invests in keeping their valuables in a safe place with high security such in safety deposit box at their local bank. Almost all banks now offer vaults and safe services for their clients. These additional services include a secured place equipped with electronic safe locks, anti-theft devices, combination locks, etc. to provide top-notch security to the customer deposits from theft, robbery, fire, natural disasters, unauthorized use, etc. These high end vaults operate with respect to biometric fingerprint locking systems, biometric scanner, electronic keypad and many other service tools and repair supplies to be sure that safety is ensured at each step. The clients are made to undergo a scan process in which their biometric identity is created by capturing their fingerprints. The advantage of doing so is to make sure that the safe or vault is accessed only by an authorized person. Each time the customer needs to withdraw something or add something to the mechanical safe locks, he/she needs to prove their identity using the biometric scanner or fingerprint memory. Apart from safety deposit boxs, high end vaults and safety locks can also be installed in places like the library, post office, hotels and workplace, etc. where dealing with money is a day to day process. Bank vaults and locks are comparatively less expensive than any other safety deposits. Safe deposits and Safe lockers are secured with insurance against disasters, fire, etc. Privacy is given priority. Therefore, nobody from the bank is allowed to see what is kept inside these lockers. A family member can be appointed to operate the locker in the absence of the actual custodian. With advantages come disadvantages, below mentioned are a couple of demerits of bank vaults and lock services. 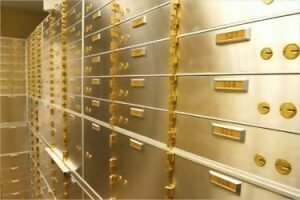 Due to the limited number of safety deposit boxes, it sometimes becomes difficult to get a cabinet in a bank, especially in rural areas. Again due to the limitation of availability, it may become difficult to get a locker of desired capacity. Generally, banks charge the rent for the lockers and vaults in advance for a specific duration, and if you plan to withdraw services in between, then you may not get the refund for the remaining period. For many, the scheme of keeping all those important documents and jewels safe at banks must be working flawlessly, but there is no guarantee for how long you can keep your belongings safe by opting to keep them at a bank. What happens if there is an emergency such as a hurricane? Or what happens if the bank is closed on Saturday, Sunday or even closing hrs during a regular week day and you need your valuables. Please call Jim Bryan Safes at 305-321-3118 or email fourbryans@aol.com for a free estimate. The customers are made to undergo a scan process in which their biometric identity is created by capturing their fingerprints. The advantage of doing so is to make sure that the safe or vault is accessed only by an authorized person. Each time the customer needs to withdraw something or add something to the mechanical safe locks, he/she needs to prove their identity using the biometric scanner or fingerprint memory. Apart from banks, these vaults and safety locks can also be installed in places like the library, post office, hotels and workplace, etc. where dealing with money is a day to day process. Consult with the best Floor Safe Expert Today!